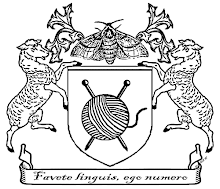 LeesyKnits: And who are we today? And who are we today? but so very complicated to shape! Did I mention that I've only got 1 room completely cleaned for Passover, and this coming Sunday I'll be gone all day in Annapolis for a Special Olympics track & field competition, along with Feivel and Kayla, both of whom still need to get their rooms cleaned? Yeah, next week is not going to be fun. I have started a little shopping, and put in an order for some odds and ends (meatballs, salads, a potato kugel, a pound of charoses) with a local kosher caterer who's going to deliver for Passover orders (hooray!). But expect some panic between now and Passover, okay? Parting shot of Gilad the goofball, who has decided he is now a big kid, and when he's not studying dinosaurs he's reading up on his new rock collection (and thanks again, Jacque F., for sending him the great rocks and the book!). Now I have to check his pockets for rocks before I do his laundry; he keeps favorite pebbles with him at all times it seems!